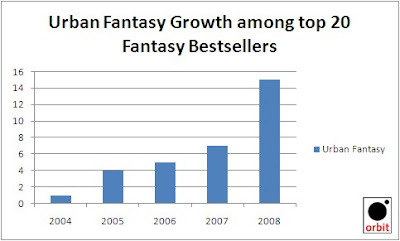 Of the 20 bestselling fantasy books of 2008, no fewer than 15 were urban fantasy. This week, no fewer than 28 of the Top 50 fantasy bestsellers in the US are urban fantasy titles. So, if urban fantasy is dominating the bestseller lists, does it follow that it is also dominating SFF publishers’ lists? It seems not – or at least not to the same extent. The proportion of urban fantasy titles published last year by the major SFF imprints in the US was 14%, considerably less than the proportion of urban fantasy books on the bestseller charts. For the complete post visit The Publishers Files. It's a growing genre and let's face it, Urban Fantasy is fun as heck to read though I still love my serious Sci-Fi and I'm really liking Steampunk. Ooh, there's a graph to start the morning with! Part of me thought for sure urban fantasy would be dead by now. I'm so very glad it isn't. I'd be interested to see if fantasy as a whole shot upwards. Because to me, a lot of it is that UF brings in a new market of readers and publishers. That's how I interpret the publisher bit, anyway. I bet pubs like Tor will be more heavily represented for 2009. It's almost 2010 though. I wonder if the bar will keep going up. I wonder if UF will keep growing. I am a huge fan of UF. :) I look forward to more UF in the future and hope it starts receiving the kudos it deserves. When I first started reading Urban Fantasy, I wondered if it would really take, because, lets face, I'm not always with popular trends. But I'm blown away that it keeps growing in popularity. I heard before that UF and paranormal are on the way out, but then maybe that's someones wishful thinking. Helps that we have some great writers out there who keep turning out the stories for us. Carolyn I'm willing to be the growth continues. Publishers are like every other business if the trend says its hot (and half the books on the best seller list says it is) then they will go with a winner. The publishers challenge is to continue to come out with fresh approaches and not just saturate the market with more of the same stories different names. PopinFresh I can't think of a genre that has made such advances and then died. I think it is here to stay as its own branch of Fantasy. Michelle being genre it won't likely win awards except with the readers. Dottie I think the chart speaks for itself. Will it sustain these levels? Probably not but it will find its permanent balance in marketshare.